First, your prose continues to improve and improve, and as it does, reading your work becomes ever more enjoyable and fun. It was a little disappointing in some ways, mostly because of fore-knowledge from the comic. Tough to do that kind of stuff. Also, in part, it was a little disappointing because the story never seemed to generate the super high tension of putting Hope and/or company in a situation that was truly dire. Running away from the Minotaur came close, but you never felt that Hope (or Mike, or Speedy) was ever in a position that they could not just brazen their way out of. Somehow. Perhaps in the next novel, you can do that little more, as you seem to do in the Peng novels. All in all, it was a very fun read, and as much as your art has improved, I think your real talent lies more in these novels. The characters in them really shine, and are fun to mentally interact with as one reads along. They could be significantly longer though, and you could try describing a bit more of the details. The description of the greek food, for instance, was great and really connected to the characters. Good work. Well worth the cost of the book, and I am looking forward to more of your work in the future. So after re-reading the comic archive for… the third time? Fourth time? I decided that you had more than earned me forking over some cash to see how your written work was. To that end, I decided to purchase a copy of “Greek Key” last weekend to download since I am more familiar with the Hope (obviously) than Rachel. It was very entertaining, and being ADHD myself, I enjoyed how you portrayed a character who deals with it in interesting situations. We all must truly value the shiny. So in conclusion; Congratulations. You will be getting more of my money since now I want to read the Rachel Peng novels. Also, thank-you for creating a fun and interesting world with some unique ideas. 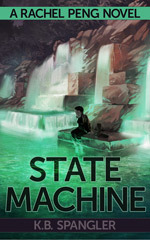 Following up to my previous comment, I have now finished reading the Rachel Peng novels up to ‘State Machine’. I am very impressed with the how well you have woven together the story and I look forward to the next novel. Honestly, I believe you should create a written version of Volume One of the comic. I enjoy the comic but it can be sometimes difficult to get someone to read a comic whereas convincing them to read a book is strangely easier. I assume this is due to hangups about what is for adults vs children. Anyway, I fully believe that these books should be on the best sellers list. I understand that as a self published author you have a more difficult time making your work known, but we really need more intelligent work like this. I’m curious – If I remember what you’ve said in the past, the Rachel Peng novels take place during the time skip. Does that hold true for Greek Key as well? Greek Key takes place at roughly the same time as State Machine. In fact the events of State Machine (about halfway through) kick off the story. If your books were available via the Google Play store, I’d be happy to buy a couple. I don’t do Kindle however. If you buy them from this site (knspangler.com) I believe you get pdf, ePub and mobi. You should be able to upload the ePub or pdf here: https://play.google.com/books/uploads and then read them from your google play reader. I love, love, loved Stoneskin and I can’t wait for the sequels. Thank you for the amazing new world and awesome characters! I am waiting on books. I provided you an alternate e-mail earlier, but if that also isn’t working, please try the one noted in the field below.